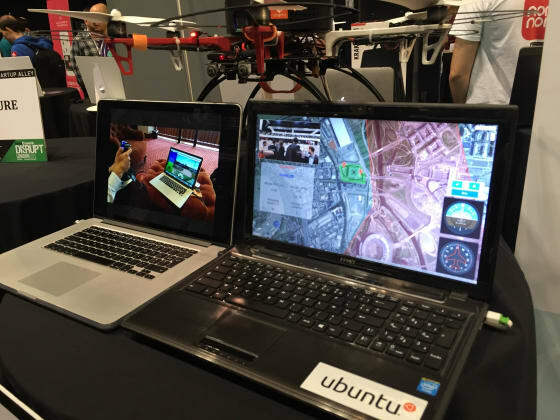 Today, at TechCrunch Disrupt, the next generation of remote controlled drones is being unveiled by UAVIA, powered by Snappy Ubuntu Core. For the first time, UAVIA is demonstrating a new generation of completely remote controlled drones. The first being used for inspection and surveillance. This will be the first time that 100% remotely operable drones will be available in the market – and they’ve been built with Ubuntu under the hood. Drones are currently complex to handle as the operator has to physically move to the site of interest to perform an inspection. Flight ranges are also very limited because of weak radio links between UAVs and operators. UAVIA lifts these technical limitations by using its Cloud Control technology as well as charging stations dispatched directly on field. This enables remote sensing and surveillance without any human intervention on field, dramatically reducing costs for companies in the need of surveillance or technical monitoring on industrial sites. This is the first step towards full autonomy which will see the drone market explode. Whilst this feels quite business-focused, there are regulatory ramifications for wider industry and consumer product development. At the moment you need to register your drones if they are of a certain size which is only suitable for B2B. Similarly, governments are not too keen on consumer-driven remote operated drones. UAVIA’s technology could be used far beyond the B2B space. It’s more likely that the Amazon delivery drones will be human operated or / assisted before being completely automated. TechCrunch Disrupt is taking place at the Copper Box Theatre in the heart of the Olympic Park. We’re demonstrating UAVIA in the hardware alley all day today, don’t forget to say hi!